Stepped away from your Mac without locking your screen first? Do it with Remote! 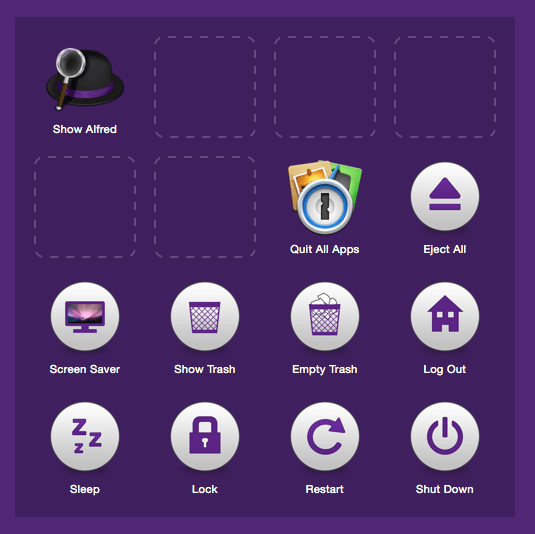 You can use any of Alfred's built-in System Commands to control your Mac from Remote. To get started, take a look at the example page of System Commands. In Alfred's Preferences on your Mac, go to the Remote preferences and click on the + button at the bottom of the Remote pages sidebar. Select Examples > System Commands to add it. Add a System Command by clicking on an empty space in the Remote preferences on your Mac. Select an action under the "System Command" menu item. Want to create your own actions? Take a look at the Workflow triggers page.